The recent flooding has brought more attention to river gauges than perhaps any time in recent history. One of the questions I have heard multiple times over the past few weeks, phrased in different ways, is why one river rises much more quickly than another after local rainfall. 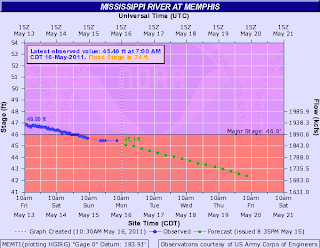 Many folks don't understand why the Mississippi River doesn't fluctuate much on the Memphis gauge when it rains locally (or assume it does), while others question the rise and fall of it's tributaries, especially the rate of change. Below are a couple of examples of the readings of local rivers following a fairly heavy rain event in the metro area (primarily over Tipton County). All three of the graphs below start at the same time and are labelled with the location of the gauge. 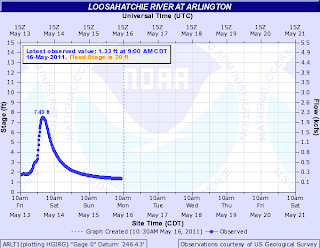 The first, the Loosahatchie River at Arlington, rose significantly (mainly after the rain ended) from about 2' to 7.5' in a matter of a few hours, then fell back to below 2' within 24 hours. The Loosahatchie in northeast Shelby County, takes runoff from the local area after recent rains and drains it to the Mississippi River. It fluctuates quickly based on local rainfall and is delayed from the period of heaviest rain as it takes some time for runoff to all collect in the river. 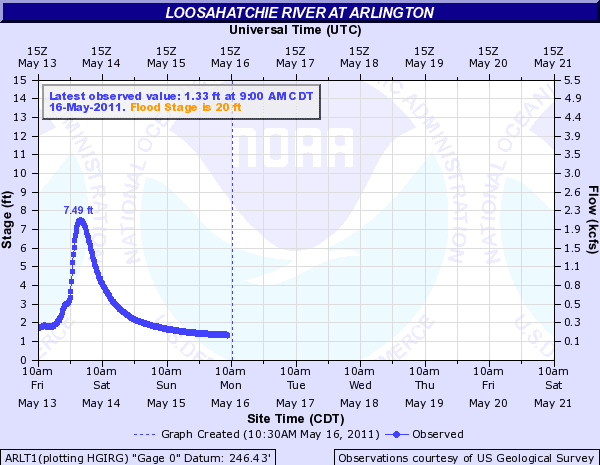 Note that when the Mississippi River is very high, as recent weeks have shown, the Loosahatchie floods over western Shelby County as it cannot discharge into the Mississippi. This backwater does not make it as far east as Arlington, however, so the high waters are not recorded on this gauge. 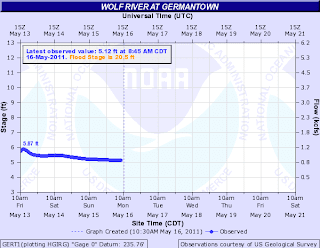 The Wolf River reacts similarly to the Loosahatchie, as it too captures runoff, this time from south and east Shelby County and Fayette County. 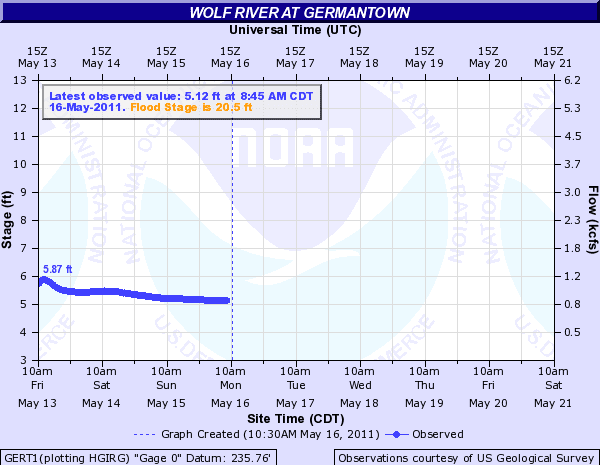 However in this case, the rain was much lighter over these areas and the Germantown Parkway gauge (south of the Agricenter) barely registered a blip at the same time that the Loosahatchie was rising by feet. Finally, the Mississippi River fluctuates very little based on local rainfall and instead responds to large amounts of water running downstream from the middle Mississippi River Valley, the Ohio River, and to a lesser extent, the Missouri River. The middle Mississippi Valley and the Ohio River each contribute approximately 50% to the water in the lower Mississippi Valley, where Memphis is. So, in the case of our recent severe flooding event, extremely heavy rain in the Ohio Valley, which caused record floods along that river, and excessive snowmelt in the Upper Mississippi River Basin, combined to produce a deluge of water in the Lower Mississippi. 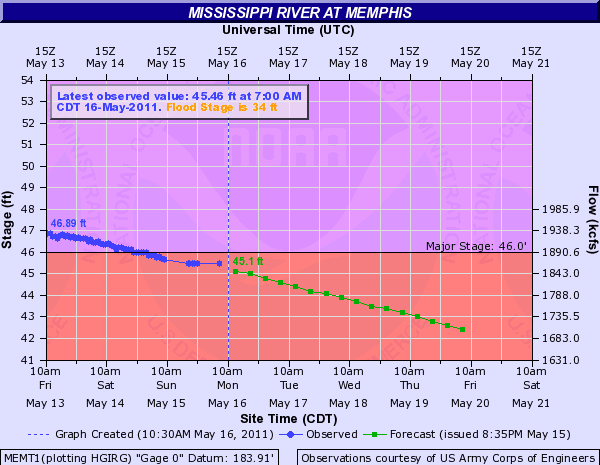 Now that the Mississippi River is falling below 45', the backwaters will begin draining from the western ends of the tributaries that run through the metro area and flooding from the Wolf, Loosahatchie, and Nonconnah Creek will subside, allowing the evaluation and clean-up process to begin.